Find this book at Amazon.com | buch7.de | eurobuch.com | buchhandel.de | books.google.com ASIN=0192806726, Category: Science, Language: E, cover: PB, pages: 576, year: 2005(1982). Since the death of Albert Einstein in 1955 there have been many books and articles written about the man and a number of attempts to "explain" relativity. 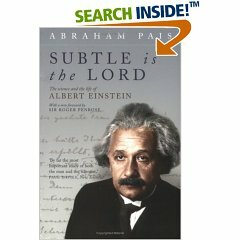 Throughout the preparation of this book, Pais has had complete access to the Einstein Archives and the invaluable guidance of the late Helen Dukas--formerly Einstein's private secretary Written with Pais' intimate and incomparable knowledge of Einstein, Subtle is the Lord will delight and inspire anyone fascinated by the man whose revolutionary ideas have defined modern physics.